The right software can transform your business, we offer custom software solutions for any application tailored to your business which are flexible for use in any industry. Keep track of production on the go, view the weight screen live from your PC and receive reports via email or text, scheduled, on-alarm or on-demand. These powerful reporting options are available on any 825 software application. When connected to the internet the 825 can send emails, save reports to your network, save reports to a USB stick and even display live web pages of transactions. Even where there is no internet connection the 825 can use mobile networks to send and receive texts. Monitor your production live by viewing and controlling the weighing screen from any PC, anywhere in the world. Complete reports available live, on-demand, on-alarm condition or scheduled via WiFi, Email, USB, SMS texts, FTP, HTML and CIFS. Receive automated texts (e.g. 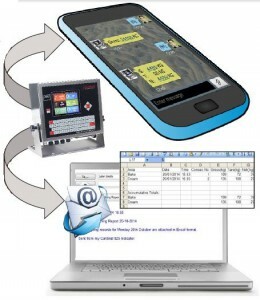 when weight reaches target), or send the 825 a text to request data – ideal for remote locations.